There are some NFL prospects to look out for in the SWAC Championship Game. Conference Championships are a big deal at all levels of college football, and especially at Historically Black Colleges and Universities. The twentieth Southwestern Athletic Conference Championship will be played Saturday in Lorman, Mississippi. It’s bad blood between both participants’ Southern University and Alcorn State. The Braves have suffered back-to-back defeats to Grambling State, while this will be Southern’s first appearance since losing to ASU in the 2014 championship. The game itself is sure to be filled with excitement, as the SWAC’s two best teams meet for the second time this season. While the overall game will be worth the watch, here’s some NFL-Worthy talent to keep an eye on. Southern Senior Safety Andrea Augustine was a Preseason All-SWAC selection for good reason. At 6’3 195 pounds, Augustine has NFL size and the game to match. Augustine is a dual-threat, a ballhawk with skills coming downhill. Augustine plays the pass just as well as the run, and is a sound tackler in the open field. Johnson recorded 53 tackles in the 2017 season, many coming downhill playing against runners trying to get outside. 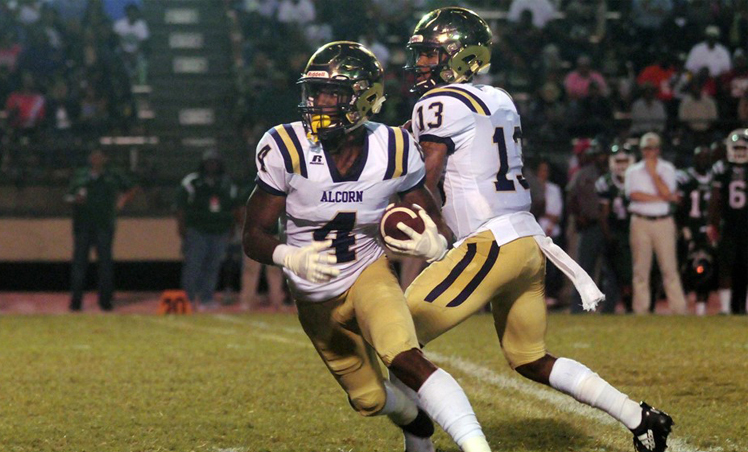 A key matchup will be seeing Augustine’s skills on tap against Alcorn State quarterback sensation Noah Johnson, who lit the Jaguars up in their matchup in September. Augustine will look to show off his sideline to sideline speed and good instincts, and the Southern Jaguars will surely need them. Alcorn State running back P.J. Simmons was the 2018 SWAC Preseason Offensive Player of The Year, and for good reason. Simmons has stepped it up with the departure of running back partner De’Lance Turner for the NFL. At just 190 pounds, Simmons is a lanky change-of-pace back whose size doesn’t define his game. Simmons is a shifty back with patience behind the tackles, and despite his frame, he isn’t easy to get down. Obviously, Simmons would not be looked at as a feature back at the next level, and that’s where his skill set comes into play. Simmons excels in the open-field, and getting him the ball on bubbles and outside handoffs is key. While not the same type of player, Simmons would be utilized at the next level similar to former North Carolina A&T and current Chicago Bears star Tarik Cohen. While this game is for all of the bragging rights and an opportunity to face North Carolina A&T in the Celebration Bowl, it’s another opportunity for these two players to prove they belong at the next level. Maybe strong performances in this game could land them a senior bowl or combine invite. Maliik Obee is an emerging NFL scout based in Maryland.